The term “consumer engagement” is a popular phrase in the marketing world these days. In this context, it means getting consumers to connect, respond and relate to your brand. An engaged consumer is more likely to make a purchase, follow your social media pages, advocate for your brand and share with friends and family. So what are you doing to engage your market? Are you asking the right questions to impact the bottom line? Are you finding out what your customers need from you, as a brand? What is the best avenue to yield the highest ROI, not just for you, but also for your consumers? Here at Next-Mark, we dive deep into a client’s identity, educating ourselves in their needs, wants and desired outcomes and turning that into an action plan for the brand. 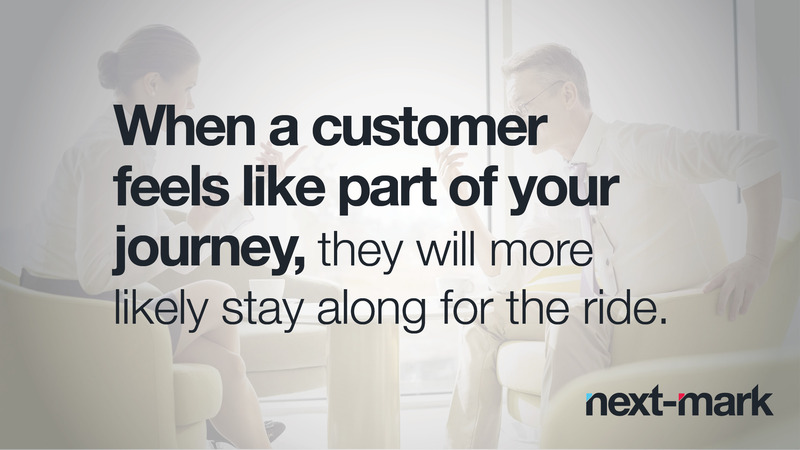 The same process must be applied to your customers. When you have a brand that resonates and inspires people, they become loyal to that brand. That is when you know you’ve made it. Loyalty, however, doesn’t happen overnight. It is a process, one that has a lot of moving parts that must be managed in order to achieve the desired result. Our team works endlessly to get you AND your customers to that happy place. So give us a call and we will ask the right questions to get to the right destination for your business.